The Mazda 2.3L DISI Turbo engine or the L3-VDT is a turbocharged version of the 2.3 MZR/L3-VE. It was first introduced in 2005 as the high-performance engine for the Mazdaspeed6 (Mazda6 MPS). The L3-VDT was subsequently installed in Mazda CX-7 and Mazdaspeed3 (Mazda3 MPS). Mazda stopped producing this engine in 2012. The 2.3 DISI engine has the same cylinder block as the naturally aspirated version. It is made of aluminum alloy, has cast-iron sleeves and a cassette type balancer unit. The turbo version was equipped with a forged steel crankshaft with eight counterweights, sinter-forged connecting rods, and pistons with the new shape adapted for the direct injection. There are oil jets in the block for lubricating and cooling the pistons. The L3-VDT has an aluminum cylinder head, the chain-driven double overhead camshafts, four valves per cylinder. The engine was equipped with a more durable roller chain instead of a pinned link timing chain in the naturally aspirated version. 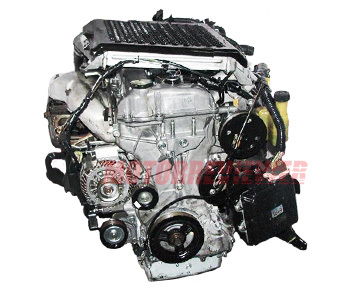 The intake camshaft also drives the high-pressure pump for the direct injection system. The camshafts position is controlled by the Mazda’s ‘Sequential Valve Timing’ (S-VT) system (variable valve timing). The valvetrain of the L3-VDT is similar to the L3-VE. There are two intake valves and two exhaust valves per cylinder which have valve angle of 39 degrees. Solid tappets actuate the valves. Intake valve lift is 9.1 mm, and exhaust valve lift is 7.7 mm. The turbo engine has a direct fuel injection system. Mazda named it as ‘Direct Injection Spark Ignition’ (DISI) system. The high-pressure pump provides the pressure of 28.3 bar to 130 bar (410-1885 psi) and supplied fuel to the injectors for direct injection into the cylinders. The 2.3L DISI Turbo engine has a fixed geometry turbine (FGT), a single-scroll turbocharger (Borg Warner KKK K0422-882). The turbocharger provides peak boost pressure of 1.076 bar (15.6 psi) available at 2500 rpm. The intake manifold of the engine is aluminum (not plastic) due to high intake air pressure inside. There is also an air-to-air intercooler mounted on top of the engine to cool compressed air. The L3-VDT engine shares a cylinder block with 2.0/2.3 Ford EcoBoost engines. These engines are not the same. EcoBoost engines have different turbochargers, cylinder head designed by Ford, and Ford's Ti-VCT variable valve timing system. Many of these engines had damaged turbochargers. There is the typical problem with turbo seals. The lousy turbo seals issue was fixed by mid 08. Some cars had issues with the timing chain and over-revving due to incorrect S-VT system operation. Like mostly all turbocharged engines, the 2.3l DISI Turbo engine does not show itself as the most reliable and durable power unit. It needs extra care, frequent quality maintenance, high-quality oil and premium fuel. The cars with 2.3l DISI engine have a poor mileage and were designed for a different purpose – go fast and make some fan. In this case, the engine life usually is not more than 120,000 miles (200,000 km).